Anthony Grenier (PGA of France) took both the individual Professional and the Team honours at the 2019 Costa Daurada International Pro-Am at Lumine Mediterránea Beach & Golf Community in Spain. Having started his final round one-shot off the lead, Grenier remained steady whilst most struggled to maintain their composure in the strong wind that blew throughout the day on Lumine’s Lakes Course. His two-under par 69 would move him to eight-under par (206) in total, giving him a comfortable four-shot advantage over the runner-up. “I am very happy. The golf courses were not easy, but my game was good, my putting was good, and my driving was excellent, so I am happy,” said the Frenchman. “I’ll be playing the PGAs of Europe Fourball Championship next week with Franck Arcivaux and we hope to do well too. I spent ten years playing on Challenge Tour, so I used to practice a lot, but now it is different - I spend most of my time teaching,” he added after going straight to the driving range after his win. PGA of Spain Professional, Emilio Cuartero, did his best this week to defend his 2018 title, but the wind proved too strong for him to keep up with Grenier. A final round two-over 71 meant he would finish his tournament at four-under par (210) taking second place, one shot ahead of PGA of France Professional, Emilien Chamaulte, who finished third on three-under (211). In the Team Pro-Am category, Grenier again placed first with his team of Stephane Desmares, David Labourguigne and Renaud Parenteau, with a total score of 255 stableford points (-39). Second place, with 248 stableford points (-32) went to team Hesbois, led by PGA of Belgium Professional, Kevin Hesbois, with Emma Van de Rostyne, Jorgo Mahieu and Stefan Cramers. 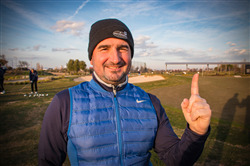 Whilst third place, with 245 points (-29), went to PGA of Italy Professional, Federico Maccario, with Lorenzo Larcher, Gianluca Capra and Mirko Taglierino Carola. For more information about the 2019 Costa Daurada International Pro-Am, visit the Tournament Hub Page (eur.pe/2019CostaDaurada), follow @PGAsofEurope (bit.ly/Pojrwy) on Twitter and search #LumineProAm (eur.pe/2ROoQSy), or like the PGAs of Europe Facebook Page (on.fb.me/RnDfEc). With thanks to LUMINE Mediterránea Beach & Golf Club (www.lumine.com), Costa Daurada (www.costadaurada.info), Cambrils (www.Cambrils-Tourism.com), La Pineda Platja (www.lapinedaplatja.info), Salou (www.visitsalou.eu), and Sol Port Cambrils (eur.pe/2QVeAqT). An Association of 34 National PGAs (29 European and 5 international) with a collective membership in excess of 13,500 golf professionals, the PGAs of Europe is committed to the advancement of golf, golfers and the golf profession across Europe.